Helen Mills studied engineering, boatbuilding, sail making and soft furnishings in England (the only girl in her class), spent 10 years as production manager in a UK sail loft and sailed in racing yachts around England and across Europe in the 1990s. She competed in one design class racing in England, France, Spain, Belgium and in two Admirals Cups – in 1997 on the Australian contender and in 1999 on the Dutch contender which was the eventual winner. Then Helen took a holiday trip to Australia in 2003, found her way to a sail loft in Sydney where she was ‘conned’ into helping repair sails for Sydney-Hobart contender Grundig. That’s how she met husband-to-be Adrian, a Hurstville boy who had managed the Sydney sail loft for 28 years with his work involving considerable on-the-water activity with cruising yachts through to Sydney-Hobart contenders and single-handed round the world racing yachts. With auto electrician brother Geoff and world-renowned sailor/boatbuilder Kanga Birtles among his Shoalhaven contacts, Adrian introduced Helen to the Nowra/Jervis Bay attractions and they became regular visitors. Then they decided to start their own business and the Shoalhaven selected itself as their base. 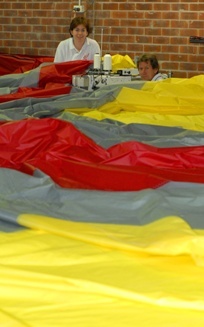 Revolution Sails and Covers started trading last December at Quinns Lane, South Nowra. ‘’We’ve been busy ever since. Helen and I work together. We came here so that our daughter could start Kindy…perfect timing…we like it here…it’s a great place for kids, better than Sydney….and we haven’t looked back…we’re surprised at how well we are going’’ Adrian said. Their reputation within the boating industry is such that even sail cloth manufacturers are sending customers to them. In mid-June, Helen and Adrian completed a sail for a 100-foot cruising catamaran based at Cairns. With a 30m luff, a sail area of 100 square metres and a dry weight approaching 150kg, the sail took Helen and Adrian three weeks to complete. 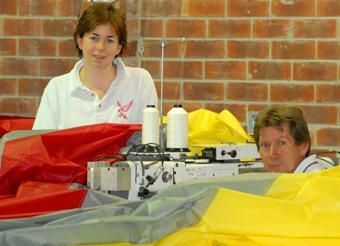 Freighted to Cairns, it was fitted then fine tuned by Cairns-based sailmaker. Work has come in from across the Shoalhaven, Batemans Bay, Bega, Canberra, Sydney – and now Cairns. Experience in three Sydney-Hobart races on the former Kanga Birtles round-the-world boat renamed Grundig then AAPT (reconfigured to squeeze eight to 12 crew in what had been single-handed accommodation), has given Adrian a full appreciation of the conditions Revolution Sails and Covers have to endure. In Sydney Adrian was involved in making the full set of sails for an 85-foot catamaran made at Kanga Birtles’ Jarkan facilities in the Shoalhaven and also undertaking most of the service work on the 15 sails aboard a 100-foot UK Supermaxi, the biggest boat contesting the Sydney-Hobart. Depending on the order, the Helen and Adrian use Kevlar, Mylar and Dacron materials. However, older technology was used to make a traditional sail for a wooden clinker Shearwater day-sailor based at Bega. As well as sails and boat covers the Mills are making shade covers, tarpaulins, truck covers and undertaking motor trimming and upholstery and marine trimming – all trades covered by their technical qualifications.